My walk in the harsh autumn light and cold breeze made me feel sad for summer. I was married this summer, I went to Tahiti for my honeymoon, I did two placements, one here, and one in Cambodia. I ate many mangoes. I discovered Cambodian mangoes. It was one of the best summers I’ve ever had. I think I wore black today because I’m truly in mourning. Also because I’m from Melbourne and when we can’t be bothered or don’t know what to wear, we wear black. 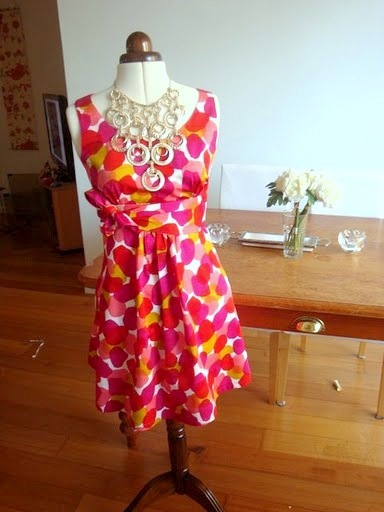 Last spring, excited about the impending warmth, I made my 09/10 summer dress. I don’t get to make clothes much these days, and average about 2 garments a year! It wasn’t a thrifty fabric choice – it was $50, but well worth it because I wore it all summer. It was my official resort wear for Bora Bora, especially at dinner time. Say what you like about rayon – when it’s done well (blended with cotton at a heavy weight), it looks beautiful. It was Vogue 8469 if you’re wondering. Mr G took this photo as I was getting ready for dinner at the resort. The shoes were a thrifty $20 from the Mileno Warehouse sale – they always have 5 pairs for $100 – great if you go with a friend. They’re a bright turquoise leather with a stacked wedge.